The people in Village 3, Thuong Nhat Commune, Nam Dong District, Thua Thien Hue Province have grown 500 banana species of Tieu and Thanh Tien. This was one of the two income raising initiatives proposed by the people in Thuong Nhat within the framework of the project “Enhancing the effectiveness of the New Rural Development (NRD) in Thua Thien Hue Province” funded by Irish Aid and implemented by Centre for Rural Development in Central Vietnam (CRD). “If closely following technical instructions, each household can earn an annual income of 6-7 million dong/35m2. We will help the people establish production groups and connect to markets in order to better guarantee the outputs for these agricultural products.”, said Mr. Pham Dinh Hien, CRD project officer regarding potential economic efficiency of the model. Tieu bananas and Thanh Tien bananas are two specialties of Nam Dong District which are famous for their deliciousness and high nutrition. As many other households in Thuong Nhat Commune, the Cotu family of Mr. Ho Van Tran used to plant these two specialties, but due to poor tree care and small-scaled production, the bananas could not grow well. 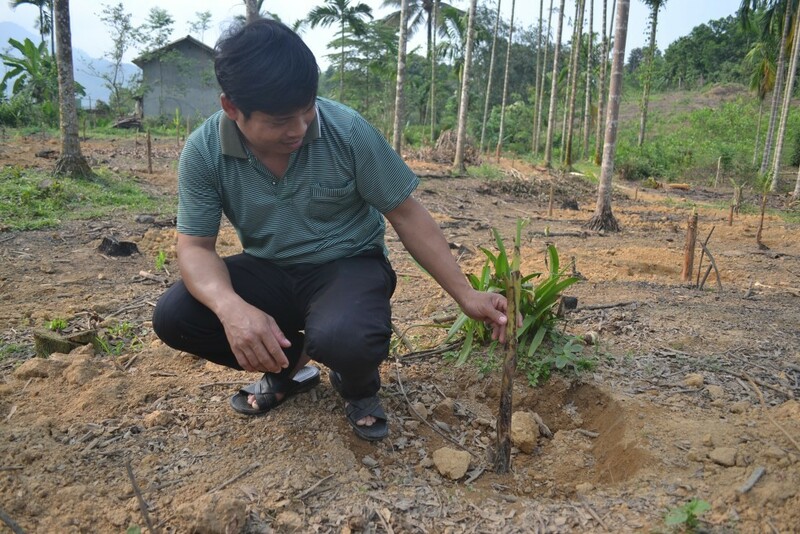 With the desire to improve their income, Mr. Tran and other farmers in Village 3 proposed the initiative to recover these 02 valuable banana varieties to create commercial value through the production in accordance with technical guidance and close market connection, especially to Hue and Da Nang. In late March, after a hands-on training by CRD technical officers, 04 pioneering households of the village eagerly collected money to purchase seedlings and started their planting. Banana seedlings were selected from the most healthy banana trees which had just put out the very first leaves after the farmers had made every effort to dig holes, purchase muck, put down basic fertilizer and carefully planted. “In comparison with other banana varieties like Cavendish or Moc, Tieu and Thanh Tien varieties were much higher in price. Over the last 03 years, the price of Tieu and ThanhTien has experienced its stability, fluctuating between 120,000 – 200,000 dong/bunch, 2 times higher than that of Cavendish, yet we don’t have enough in stock for sale”, said Mr. Tran. 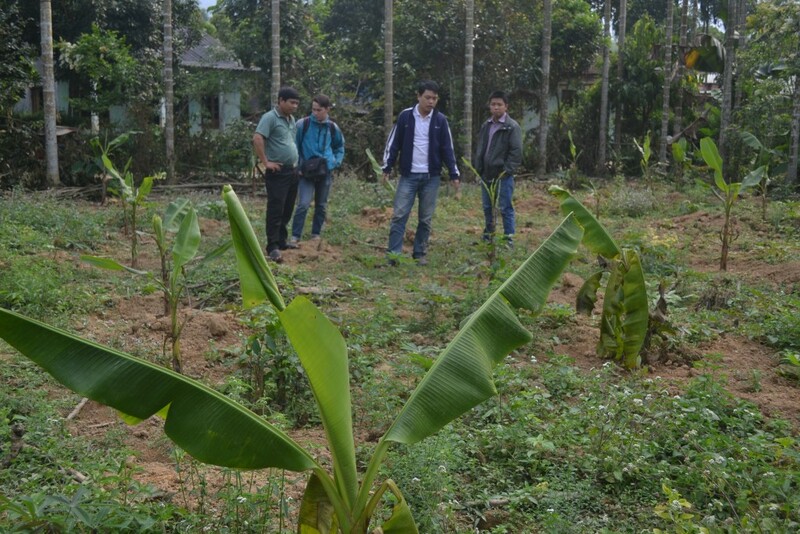 “Success in the recovery of 02 varieties of specialty bananas will be the driving force not only for the 4 pioneering households in Village 3 but also for the other households in Thuong Nhat to learn and to follow, making way for sustainable livelihoods. Raising the income for the people will help the commune reach NRD standards faster “, said Ms Ho Thi Hoa, Vice Chairwoman of Thuong Nhat Commune People’s Committee.